This outdoor heated cabinet has been designed specifically for use within an old telephone box and is equipped with a secure keypad lock to prevent theft of your defibrillator. Produced to the highest standard, the cabinet will guarantee complete protection of your device against day-to-day wear and theft, ensuring that it is available to use in a cardiac arrest emergency. The bold design of this cabinet ensures maximum visibility is achieved and your AED can be easily retrieved. Prior to purchasing this cabinet, please contact your local ambulance service for the code required in your area. 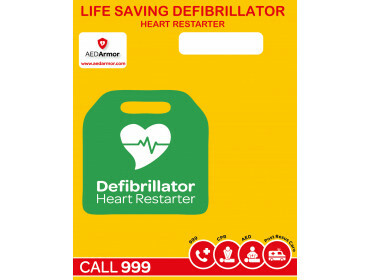 You will then have to provide this information to defibshop so we can ship the cabinet with its required code, preset. Do you have a question regarding this product, or any of the other products from the AED Armor range? We invite you to call our product specialists on 0333 678 0246.